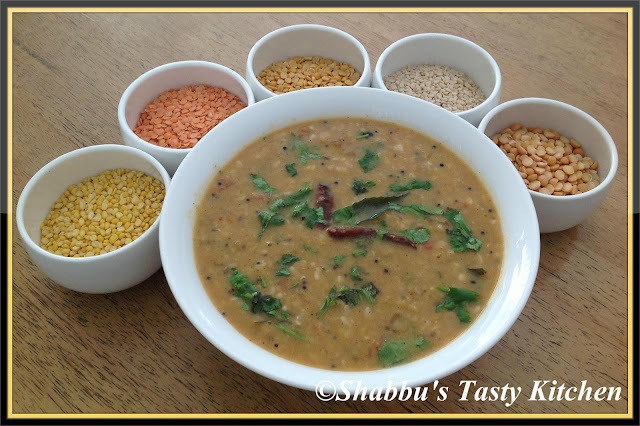 Panchkuti Dal is a mix of 5 different dals - toor dal, masoor dal, chana dal, moong dal and urad dal. Wash all the dals and soak for 1 hour. Pressure cook it adding 4-5 cups of water and little salt. Heat oil in a pan, add mustard seeds, cumin seeds, cloves and cinnamon and fry until they begin to crackle. Add the curry leaves, dry red chillies, green chillies, ginger and garlic and fry for 1 minute. Add chopped tomatoes, garam masala, cooked dals, lemon juice and salt , mix well and boil for 8- 10 minutes. I added little chilli powder and turmeric powder in this recipe..
OMG.. such a tasty looking dal..yummy. Dal is my favourite any day..
wow! delicious and yummy... thanks for visit my space and be my friend... happy to follow you!!! The picture looks great... I love this dal! This sounds great and looks delicious. Wonderful presentation! Looks delicious.. Is this like soup? Thats a delicious and yummy dal. Panchkuti dal is super yummy and healthy Shabbu. Never tried dal this method..
What a great combination of daal! Look wonderful! sounds so doable..am going to make this now for lunch..good one.. Very healthy and tasty panchkuti dal. Njanum ithu undakkan nokki vachirikuvanu..Looks delicious. Wow! 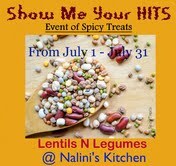 So much dal in one dish!! Definitely healthy and delicious!! My husband is a big dal fan and so it's a must have side dish on my dinner table almost every day. I'll definitely try this one inshallah.